lathes together with catalogues in German, French and English. Introduced in the mid 1950s and labelled variously as the "Lesto", "Scinta", "Cintra" and "Bläsi", the Scintilla 110 mm (45/16") centre height lathe was made in Switzerland by Scintilla S.A. with parts and servicing eventually passing into the hands of KMD AG Deitingen. This arrangement survived until March 2007, when the company was declared bankrupt and (instead of being sold to a local enthusiast) the remaining spares and accessories were scrapped despite a better offer from an enthusiast keen to keep the brand going (photographs of the deserted factory are at the bottom of the page). In addition, it is believed that the Swiss firm INCA (based in Teufental, post code CH-5723 ) continued, for some time, to produce a woodturning version of the lathe, i.e. a simplified, lighter model that lacked the cast-iron base and steel supporting rail for the carriage (should any reader have an INCA, the writer would be interested to hear from you). 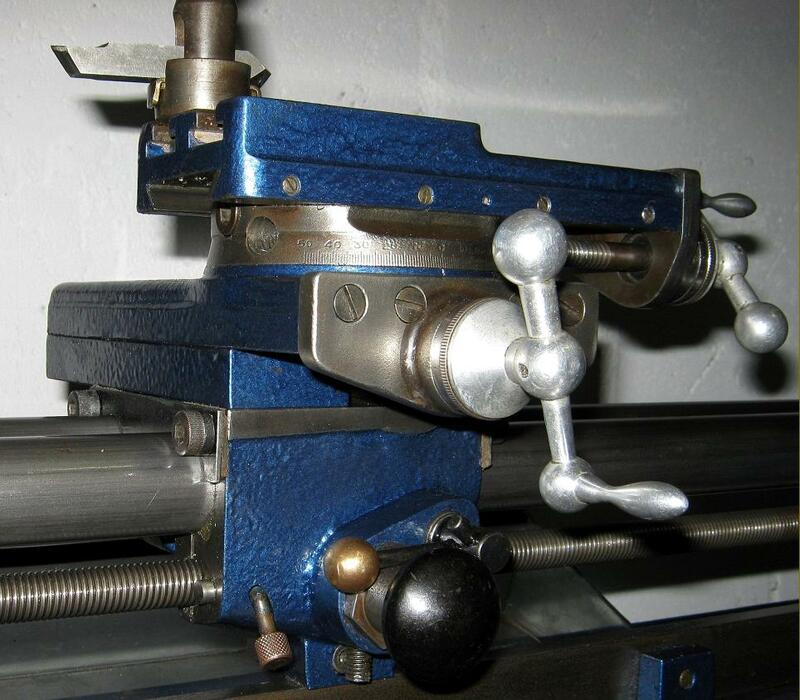 Obviously a machine of high quality, tested to Schlesinger standards, the lathe was built on a two-bar bed with an optional cast-iron under-tray (complete with motor-platform mounting lugs) designed to add a significant degree of stiffness to the structure. A choice of two bed lengths was offered (at the same price): 620 mm and 870 mm (24.4" and 34.3") - which gave distances between the No. 1 Morse centres of 400 mm and 650 mm (15.7" and 25.6") respectively. However, at extra cost any length of bed could be ordered - up to a maximum of 1500 mm - and, if the customer desired, the factory would supply the bed rails with a hard-wearing, chrome-plated finish. 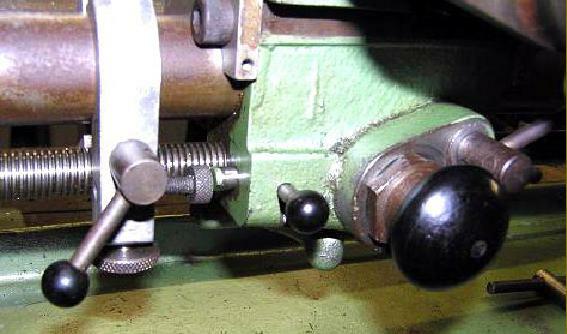 The lathe was offered in a two forms - as a basic unit for wood and hand-turning (Models GD100 short-bed, GD102 long bed) or as the more complete Models GD1123 short and GD1124 long to various specifications with screwcutting by changewheels driving through a tumble-reverse mechanism. The standard changewheel set consisted of just five gears able to produce one (automatically-disengaged) sliding feed of 0.002" (0.05 mm) per revolution of the spindle. Twelve extra gears: 40, 48, 50, 55, 60, 63, 64, 70, 72, 75, 80, 90 and 96 were available to produce a wide range of metric threads - with a 127 translation gear (at further cost) to generate English pitches. 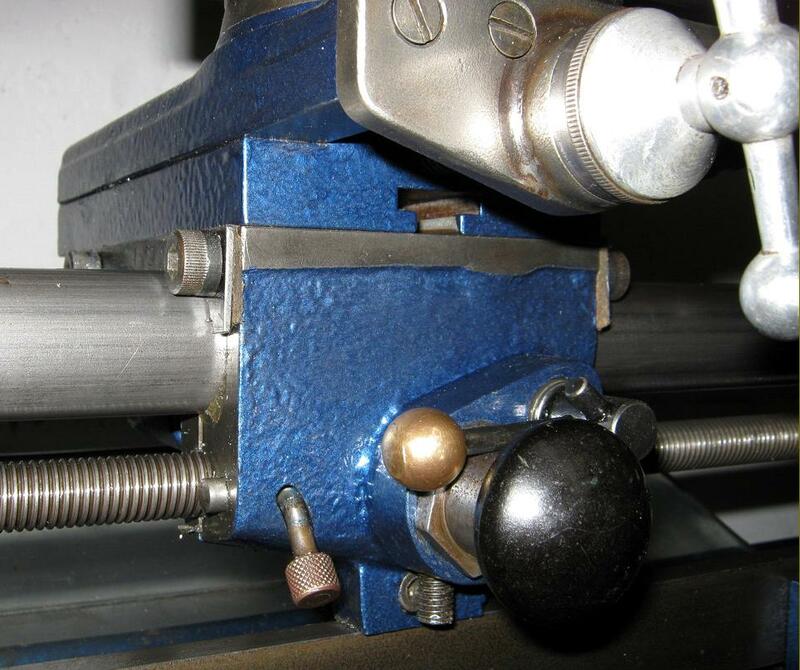 Little equipment was supplied as standard, the GD100/2 arriving with only a driving plate, a 3-pronged centre for wood turning, a long hand T-rest and support, two No. 1 Morse centres, a single collet with a No. 1 Morse taper, the spindle-driving pulley complete with a ring of indexing holes, the indexing plunger - and a spanner. One interesting accessory was an outboard "bowl-turning" faceplate, mounted on the face of a special, single-speed, spindle-drive pulley. The customer who ordered the metal-turning GD1123/4 received, in addition, a cast-iron base plate (either the GDZ511 - or the longer GDZ514) a 3-jaw chuck, a flat drilling pad on a No. 1 Morse taper, a screwcutting leadscrew, a tumble-reverse assembly (engineered in a most unusual way), a most handy automatic-disengagement trip for the carriage feed, five changewheels, a compound slide rest and a built-in reversing switch. The factory would also construct machines to a specific specifications, with parts drawn from the options' list. Driven by a simple, overhung 4-step V-pulley directly from the motor, the 35/64" (14 mm) bore spindle and headstock assembly looked not unlike that used on the American Delta wood-turning lathe. Surprisingly, no form of speed-reducing countershaft was available; instead, Scintilla offered an alternative pulley for the motor that contained a beautifully-engineered 16 : 1 epicyclic reduction-ratio gearbox - this accessory both doubled the number of speeds (to eight) while giving a bottom speed sufficiently low for both screwcutting and the turning of large diameter jobs. The speed-reduction setting was engaged and disengaged by a large black plastic knob protruding from the end face of the assembly - pictures of a dismantled unit can be seen on this page. One wonders if this unit was made available by the makers as an accessory for other lathes - it would certainly have found a ready market and, in that respect, was superior to the built-in system as used, for example, on the well-known Carstens, the Craftsman 109 lathes, the George Adams Round-bed, the head of the Dore Westbury miller. Besides the usual range of accessories offered with a precision lathe - chucks, collets and steadies, etc. 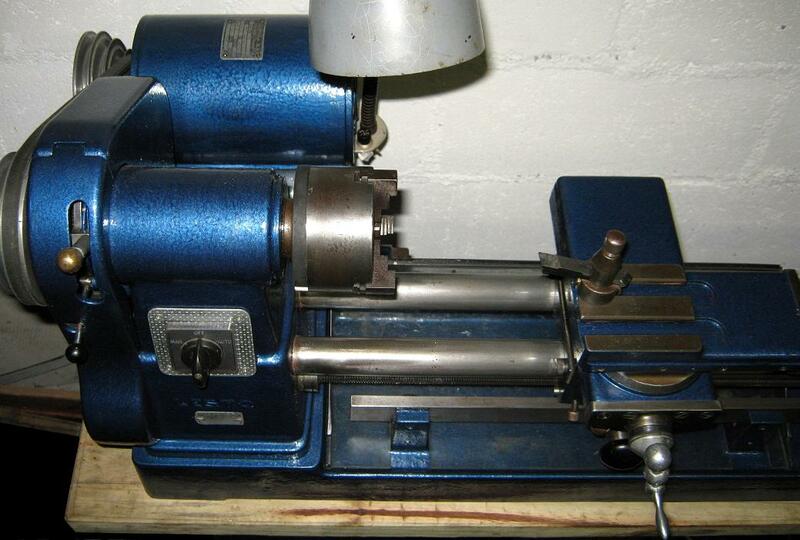 - several more unusual items were listed including a jigsaw, wood planer, tilting saw bench, sheet-metal "nibbler", flexible drive unit- and a finely-made spherical-turning tool..
Scintilla "Lesto" screwcutting lathe Model GD 1123 with compound slide rest and built-in electrical switch. Note the sliding stop fastened to the front bed rail - this was used to provide a handy automatic trip to the carriage feed. 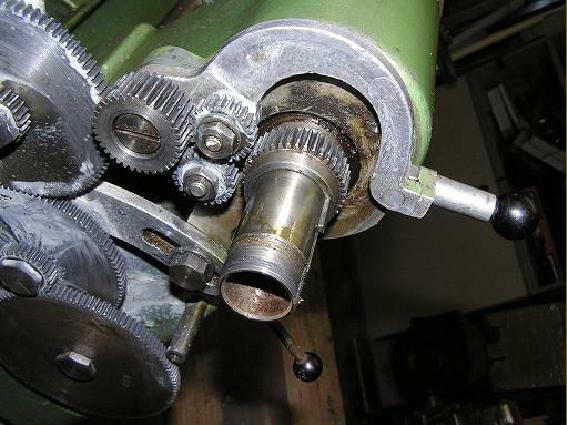 Speed-reducing pulley in place on the original maker's-supplied motor. The 16 : 1 speed-reducing motor-mounted pulley unit. Angle plate to mount the vice horizontally on the vertical slide. Vertical slide complete with indexing unit and interchangeable vice. Cast-iron base tray with lugs to mount the pivoting motor plate. Jigsaw with its own drive pulley fitted. Wood Planer to mount on the bed rails. 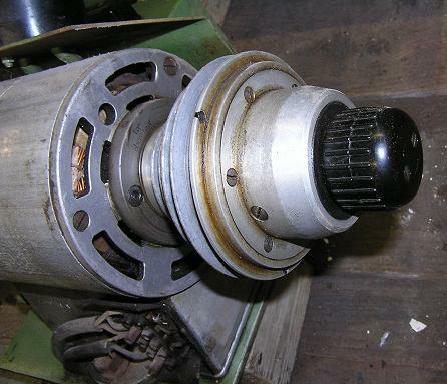 The jigsaw Attachment was driven from the headstock spindle - alternatively, it could be provided with its own drive pulley and rigged as a separate machine. The rather fine bed-rail mounting tilting saw-bench attachment.